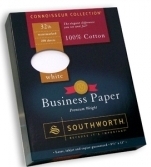 100% Cotton Content Paper by Southworth, Ivory, 250 sheets per box, 32 lb. Why 100% Cotton? Because it lasts! Higher cotton content paper doesn't yellow over time and wont' deteriorate. Use this for your most important documents such as Deeds, Wills and Trusts. 250 sheets per box.